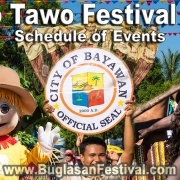 The municipality of Basay will be celebrating their fiesta and Kapaw Festival 2019 from March 11 – 18, 2019. View the full schedule here! The Miss Mabinay 2019 or the Langub Festival Queen 2019 was held last January 22, 2019, at the Mabinay Covered Court. View pictures and video here! 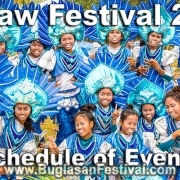 The Langub Festival 2019 in Mabinay was held last January 24, 2019 with colorful costumes and loud drums. Read more, View Gallery and Watch Video here! There is not much to say about the Miss Jimalalud 2019, but WOW! Read more and View Gallery here. Watch the Miss Jimalalud 2019 Video here! The municipality of Jimalalud celebrated the Sinulog Festival 2019 last January 13, 2019, with colorful costumes and loud music. View Gallery Here! 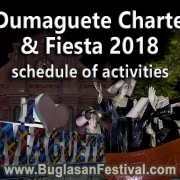 Don’t miss the Miss Dumaguete 2018 Coronation Night and Civic & Military Parade this 70th Dumaguete Charter Day and Fiesta 2018. Find Schedule here!